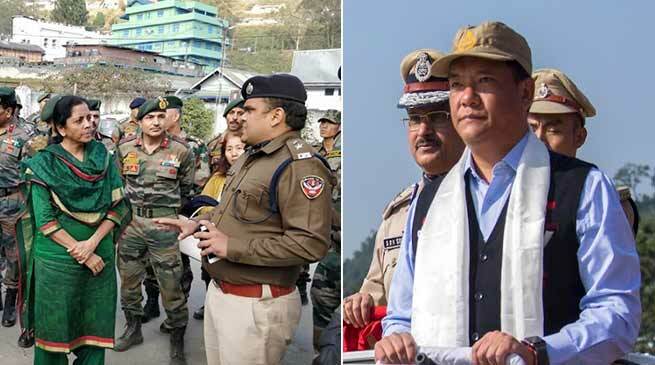 Commenting on the recent Bomdila incident involving Indian Arunachal Scout and the Arunachal police, Chief Minister said the incident was unfortunate, He was speaking at 46th Raising Day celebration of Arunachal Pradesh Police here at IG park. He said steps are being taken to improve the relation between the Indian Army, local administration and the state police. A monthly sitting will be held between the Army and the state police for maintaining harmonious relation and to resolve issues. He directed the state police head to ensure that all necessary steps be taken so that relations with the armed forces are maintained. On the other hand Union Ministers Nirmala Sitharaman and Kiren Rijiju took stock of the situation of the clashes between Arunachal Scout and Arunachal Pradesh Police personnel here on Wednesday. A group of soldiers of Arunachal Scout had allegedly vandalised the Bomdila police station, assaulted and misbehaved with civilians and police personnel on November 2 at the Buddha Mahotsav celebrations. Later, the Union Ministers visited the Bomdila police station to see the damages and gave a patient hearing to the lady police officials and the Officer-in-Charge (OC) of the Bomdila Police Station who were on duty that day. Both Sitharaman and Rijiju also met members of the civil society as part of confidence-building measures. Sitharaman visited Arunachal Pradesh to celebrate Diwali along with soldiers posted in the forward areas along the Sino-Indian border.